JCI Industries, Inc. More Than Doubles Shop Size, Demonstrating Service Commitment to Regional Customers. | JCI Industries Inc.
Home / JCI In the News / JCI Industries, Inc. More Than Doubles Shop Size, Demonstrating Service Commitment to Regional Customers. Comments Off on JCI Industries, Inc. More Than Doubles Shop Size, Demonstrating Service Commitment to Regional Customers. Lee’s Summit, MO. (Feb. 16, 2016) – JCI Industries, Inc. (JCI), a leading regional provider of industrial and municipal pumps, fluid handling equipment, motors, drives and controls, announces today the expansion of its shop at its headquarters in Lee’s Summit, MO. JCI’s Lee’s Summit complex includes the 45,000 square-foot shop and 18,000 square-foot distribution facility along with office and conference space. The expansion more than doubled the previous shop size, allowing for improved work flow and the accommodation of additional in-house machine tooling and shop equipment. Upgraded forklifts and the addition of multiple jib and overhead cranes, including two 20-ton bridge cranes, now provide the capability to handle up to 40 tons with in-house equipment. This increased lifting capability and space enables work on larger pieces of equipment in JCI’s shop. 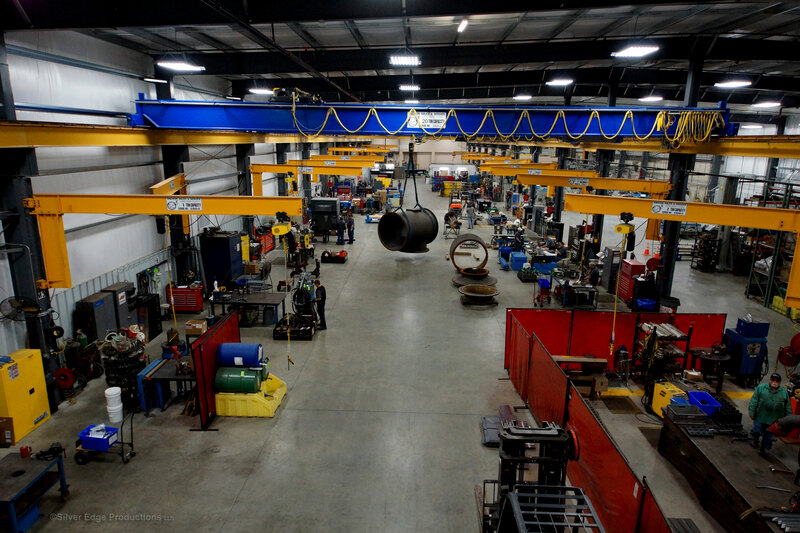 JCI has also increased machining capabilities with the addition of multiple lathes, a large horizontal boring mill, ID and OD grinders, and an in-house blasting booth. JCI is as an active supporter of the community and works with the Lee’s Summit School District, Cristo Rey Kansas City High School and the University of Central Missouri on educational programs, training, internships and mentoring opportunities. JCI Industries, Inc. is the leading regional provider of electrical and mechanical solutions for industrial and municipal water and wastewater markets. Founded in 1975, JCI provides mechanical and electrical equipment and parts, pump and electric motor repair, equipment packaging, fabrication and factory authorized repair services throughout the Midwest region. JCI’s Lee’s Summit headquarters near Kansas City includes an 82,000 square foot complex consisting of offices, shop and a distribution center with more than 2,000 motors and drives in stock. JCI partners with customers to maximize equipment service life while minimizing downtime and costs through preventive maintenance, motor management and other programs. JCI’s markets include: water, wastewater, power, oil & gas, pipeline, pharmaceutical, pulp and paper, chemical, food processing and other general industry. For more information, please visit www.jciind.com.